Next week's The Open Group conference in San Diego comes at an important time in the evolution of IT and business. And it's not too late to attend the conference, especially if you're looking for an escape from the snow and ice. Registration is open to both members and non-members of The Open Group. For more information, or to register for the conference in San Diego please visit: http://www.opengroup.org/sandiego2011/register.htm. Registration is free for members of the press and industry analysts. I've found these conferences over the past five years an invaluable venue for meeting and collaborating with CIOs, enterprise architects, standards stewards and thought leaders on enterprise issues. It's one of the few times when the mix of technology, governance and business interests mingle well for mutual benefit. Change management processes requiring an advanced, dynamic and resilient EA structure will be discussed in detail during The Enterprise Architecture Practitioners Conference on Feb. 8. The Cloud Computing track, on Feb. 9, includes sessions on the business and financial impact of cloud computing; cloud security; and how to architect for the cloud -- with confirmed speakers Steve Else, CEO, EA Principals; Pete Joodi, distinguished engineer, IBM; and Paul Simmonds, security consultant, the Jericho Forum. I'll be moderating an on-stage panel on Wednesday on the considerations that must be made when choosing a cloud solution -- custom or "shrink-wrapped" -- and whether different forms of cloud computing are appropriate for different industry sectors. The tension between plain cloud offerings and enterprise demands for customization is bound to build, and we'll work to find a better path to resolution. 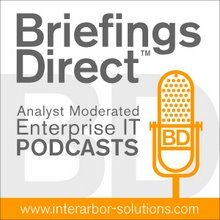 I'll also be hosting and producing a set of BriefingsDirect podcasts at the conference, on such topics as the future of EA groups, EA maturity and future roles, security risk management, and on the new Trusted Technology Forum (TTF) established in December. Look for those podcasts, blog summaries and transcripts here over the next few days and weeks. For the first time, The Open Group Photo Contest will encourage the members and attendees to socialize, collaborate and share during Open Group conferences, as well as document and share their favorite experiences. Categories include best photo on the conference floor, best photo of San Diego, and best photo of the conference outing (dinner aboard the USS Midway in San Diego Harbor). The winner of each category will receive a $25 Amazon gift card. The winners will be announced on Monday, Feb. 14 via social media communities. It's not too late to join in, or to plan to look for the events and presentations online. Registration is open to both members and non-members of The Open Group. For more information, or to register for the conference in San Diego please visit: http://www.opengroup.org/sandiego2011/register.htm. Registration is free for members of the press and industry analysts.